05:00 Pickup from your hotel and transfer to Istanbul airport for the flight from Istanbul to Cappadocia. 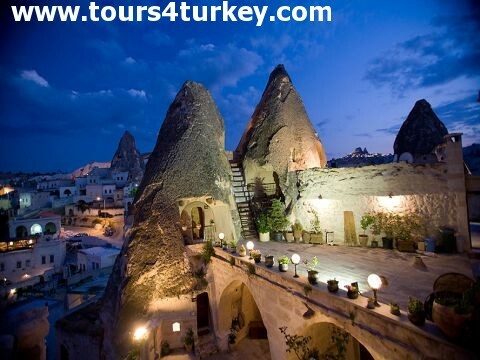 After the tour transfer to hotel and stay the night in Urgup or Goreme. Overnight stay in Cappadocia (Cave Hotel). Devrent, Zelve, Monk Valley, Goreme open air museum, Pigeon Valley, Uchisar Castle. Today you will visit Kizilcukur, Cavusin Village, Derinkuyu Underground City, Ortahisar, Catalkaya. After the tour transfer to Kayseri airport and fly back to Istanbul by Turkish Airlines. 21:55 Arrival in Istanbul, greeting in the airport, transfer to your hotel. • Transportation by a comfortable A/C non-smoking Luxurious car / Van with professional driver.